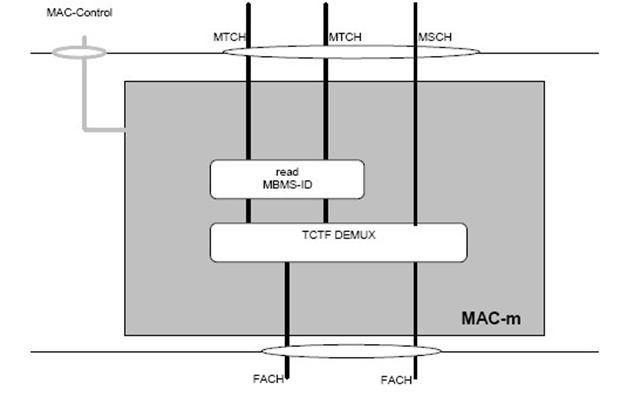 MAC is a layer 2 protocol in the UMTS Access Stratum. 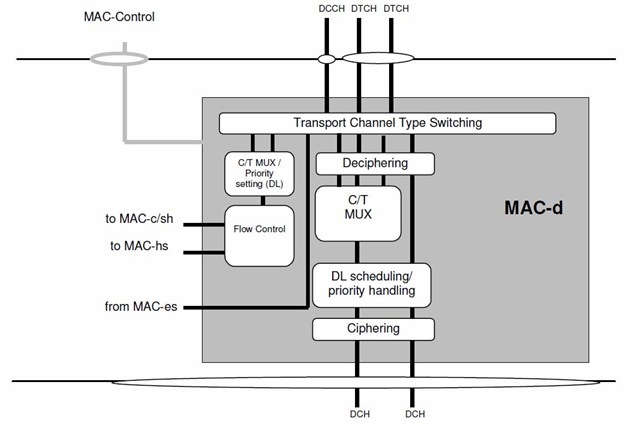 MAC has the input as logical channels and at the output it has transport channels. 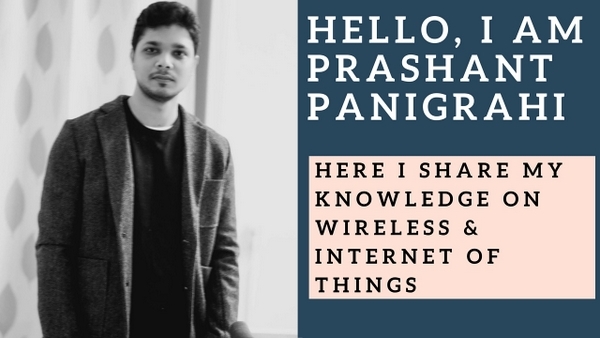 Logical channels define ‘WHAT’ type of information is being transferred and transport channel defines ‘HOW’ the information is being transferred. 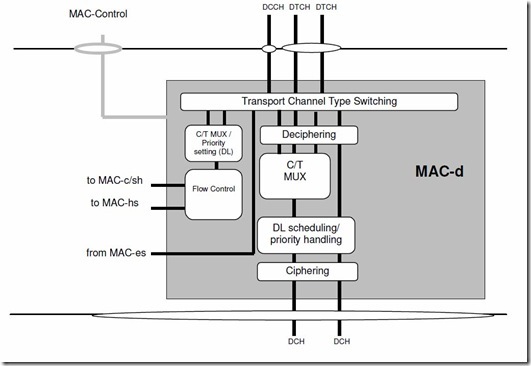 So one of the primary objective of MAC is to map appropriate logical channels on transport channel. NOTE: Before proceeding check out the different types of logical channels and transport channel here. 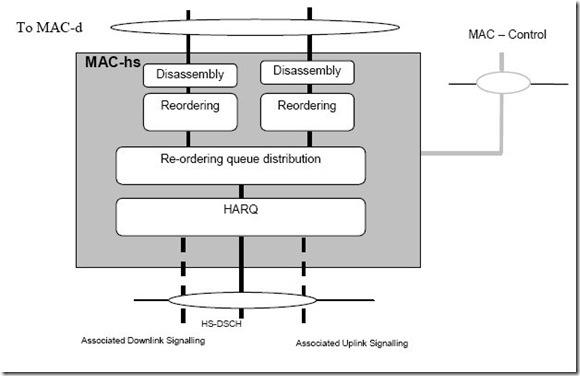 downlink shared channel (DSCH). The DSCH exists only in TDD mode. uplink shared channel (USCH). The USCH exists only in TDD mode. enhanced dedicated transport channel (E-DCH). There is one MAC-c/sh/m entity present in the UE side. The following functionality is covered by this MAC entity. 2. the MBMS Id identifies received data to an MBMS service. in the uplink, the possibility of transport format selection exists. this functionality is used to transmit the information received from MAC-d on RACH based on logical channel priorities. 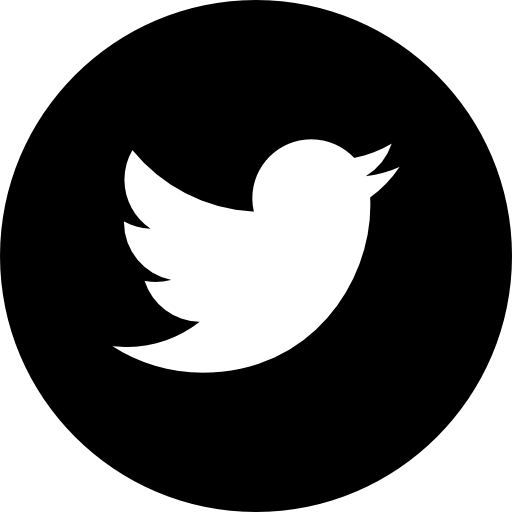 This function is related to TF selection. transport format and transport format combination selection according to the transport format combination set (or transport format combination subset) configured by RRC is performed. NOTE: There is one MAC-d entity in the UE side. 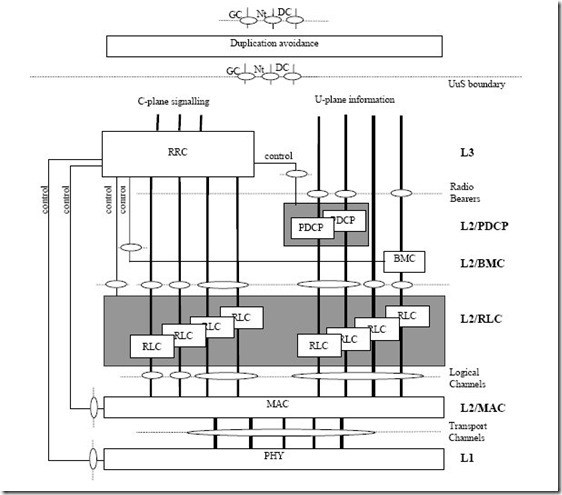 Transport Channel type switching is performed by this entity, based on decision taken by RRC. This is related to a change of radio resources. If requested by RRC, MAC shall switch the mapping of one designated logical channel between common and dedicated transport channels. 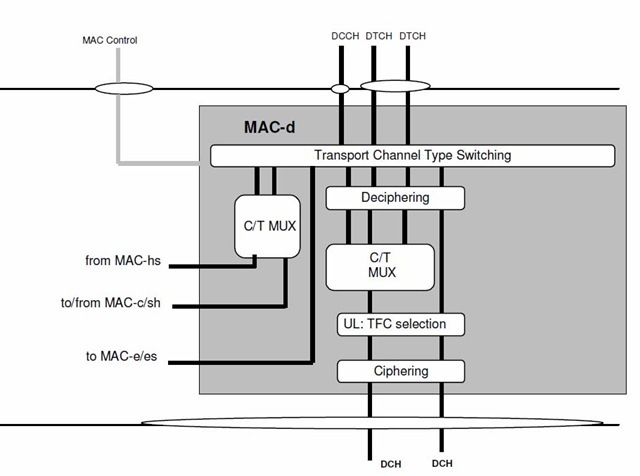 The C/T MUX is used when multiplexing of several dedicated logical channels onto one transport channel (other than HS-DSCH) or one MAC-d flow (HS-DSCH) is used. An unambiguous identification of the logical channel is included. 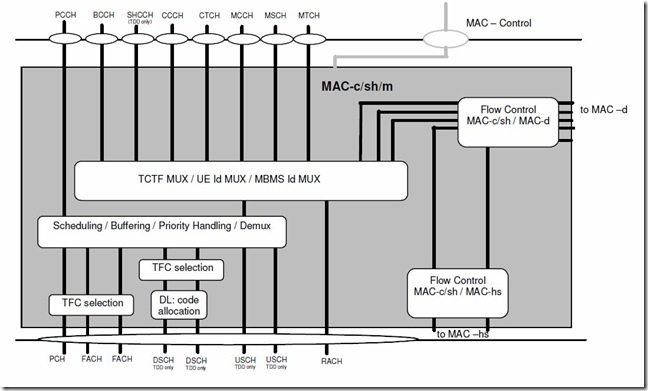 If MAC-ehs is configured, C/T MUX toward MAC-ehs is not used. Ciphering for transparent mode data to be ciphered is performed in MAC-d.
Deciphering for ciphered transparent mode data is performed in MAC-d. 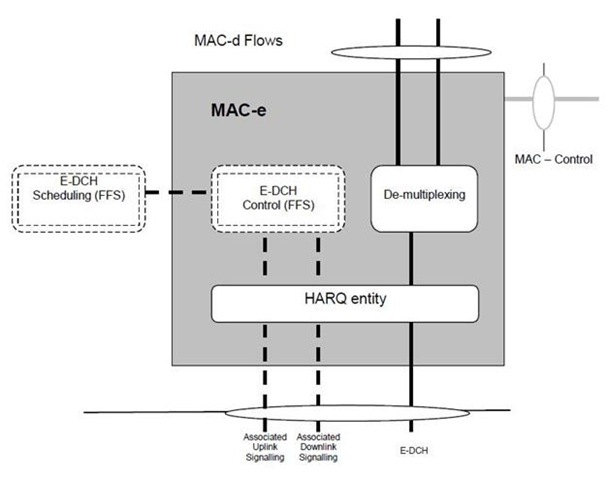 The HARQ entity is responsible for handling the MAC functions relating to the HARQ protocol. 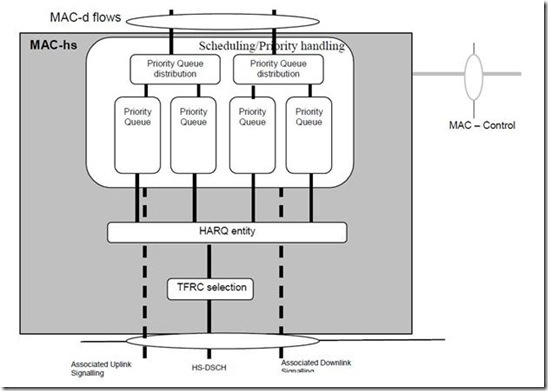 The HARQ functional entity handles all the tasks that are required for hybrid ARQ. 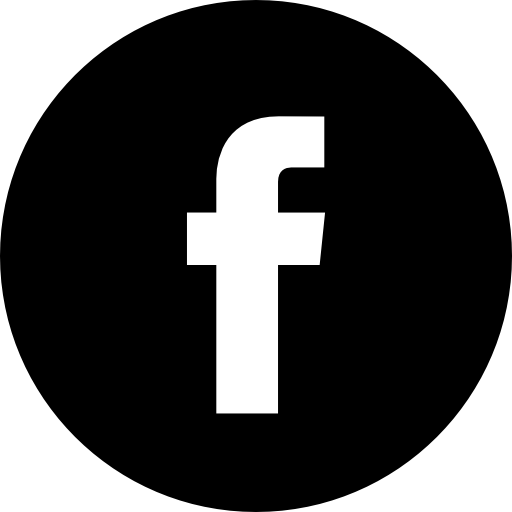 It is responsible for generating ACKs or NACKs. The detailed configuration of the hybrid ARQ protocol is provided by RRC over the MAC-Control SAP. The maximum number of HARQ process per HS-DSCH per TTI on which an HS-DSCH transmission can be received is one. The reordering queue distribution function routes the MAC-hs PDUs to the correct reordering buffer based on the Queue ID. The reordering entity reorders received MAC-hs PDUs according to the received TSN. MAC-hs PDUs with consecutive TSNs are delivered to the disassembly function upon reception. MAC-hs PDUs are not delivered to the disassembly function if MAC-hs PDUs with lower TSN are missing. There is one reordering entity for each Queue ID configured at the UE. The disassembly entity is responsible for the disassembly of MAC-hs PDUs. When a MAC-hs PDU is disassembled the MAC-hs header is removed, the MAC-d PDUs are extracted and any present padding bits are removed. Then the MAC-d PDUs are delivered to higher layer. The MAC-es/e handles the E-DCH specific functions. 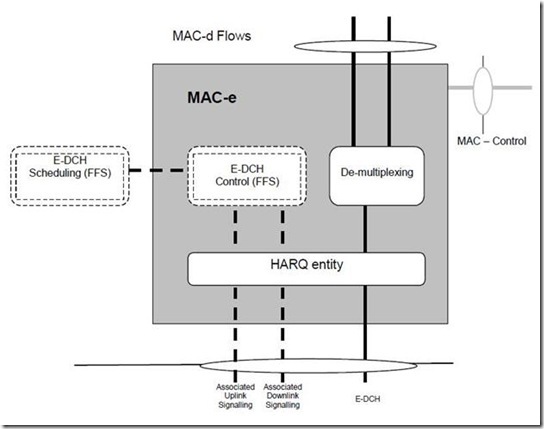 The HARQ entity is responsible for handling the MAC functions relating to the HARQ protocol. It is responsible for storing MAC-e payloads and re-transmitting them. For FDD: The HARQ entity provides the E-TFC, the retransmission sequence number (RSN), and the power offset to be used by L1. Redundancy version (RV) of the HARQ transmission is derived by L1 from RSN, CFN and in case of 2 ms TTI from the sub-frame number. 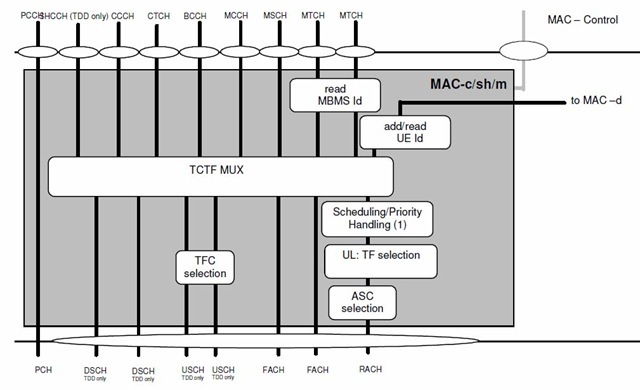 The multiplexing and TSN setting entity is responsible for concatenating multiple MAC-d PDUs into MAC-es PDUs, and to multiplex one or multiple MAC-es PDUs into a single MAC-e PDU, to be transmitted in the next TTI, as instructed by the E-TFC selection function. It is also responsible for managing and setting the TSN per logical channel for each MAC-es PDU. This entity is responsible for E-TFC selection according to the scheduling information, Relative Grants (FDD only) and Absolute Grants, received from UTRAN via L1 and Serving Grant value signalled through RRC, and for arbitration among the different flows mapped on the E-DCH. 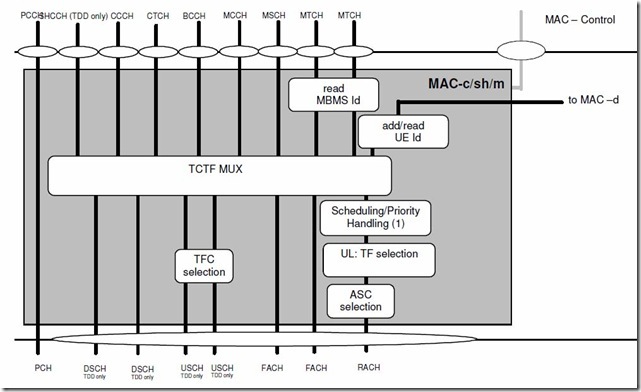 The Scheduling Access Control entity is responsible for routing associated uplink signalling via E-UCCH and MAC-e PDU (in the case that E-DCH resources are assigned) or via E-RUCCH (in the case that no E-DCH resources are assigned). It is also responsible for obtaining and formatting the appropriate information to be carried on E-UCCH/E-RUCCH. NOTE: HARQ process ID and RSN are carried on E-UCCH. This function manages FACH and for TDD DSCH resources between the UEs and between data flows according to their priority and delay requirements set by higher layers. For MTCH channels, the MBMS Id field in the MAC header is used to distinguish between MBMS services. In the downlink, transport format combination selection is done for FACH and PCH and for TDD DSCHs. For TDD operation the demultiplex function is used to separate USCH data from different UEs, i.e. to be transferred to different MAC-d entities. For TDD this function is used to indicate the code used on the DSCH. A flow control function exists toward MAC-d to limit buffering between MAC-d and MAC-c/sh/m entities. A flow control function also exists towards MAC-hs in case of configuration with MAC-c/sh/m. If requested by RRC, MAC shall switch the mapping of one designated logical channel between common and dedicated transport channels. This is the case when UE moves from CELL_DCH state to CELL_FACH state. 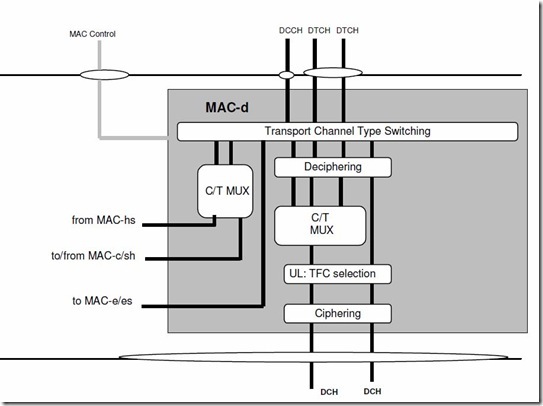 The function includes the C/T field when multiplexing of several dedicated logical channels onto one transport channel (other than HS-DSCH) or one MAC-d flow (HS-DSCH) is used. This function is responsible for priority setting on data received from DCCH / DTCH. Ciphering of transparent mode data is performed in MAC-d.
Deciphering of transparent mode data is performed in MAC-d. 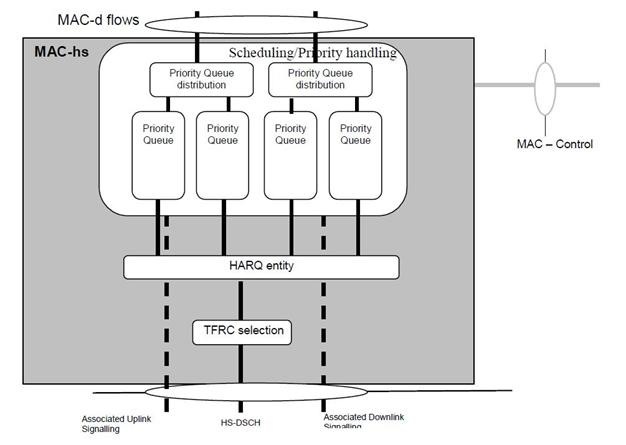 In the downlink, scheduling and priority handling of transport channels is performed within the allowed transport format combinations of the TFCS assigned by the RRC. A flow control function exists toward MAC-c/sh/m to limit buffering between MAC-d and MAC-c/sh/m entities. 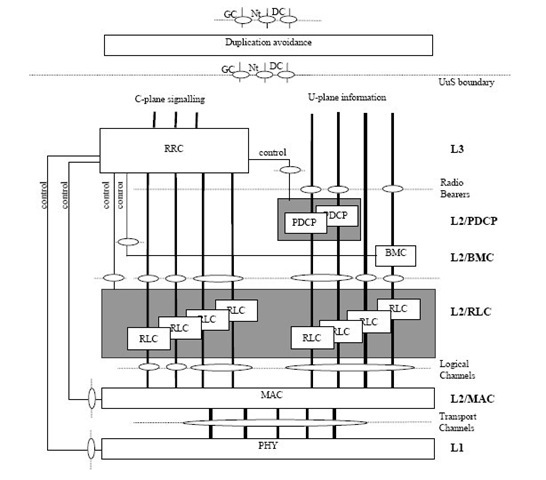 This function is intended to limit layer 2 signalling latency and reduce discarded and retransmitted data as a result of FACH or for TDD DSCH congestion. For the Iur interface, a flow control function also exists towards MAC-hs/ehs in case of configuration without MAC-c/sh/m. The MAC-hs is comprised of four different functional entities. 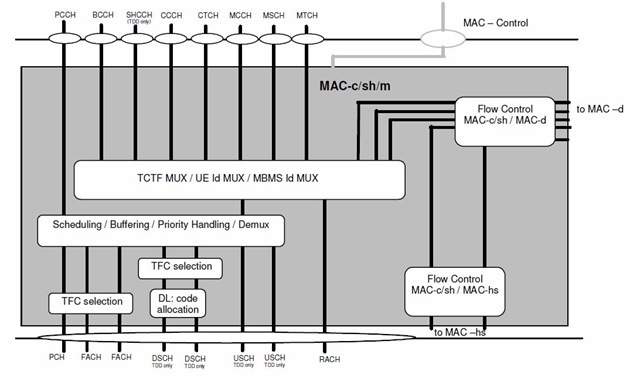 This is the companion flow control function to the flow control function in the MAC-c/sh/m in case of configuration with MAC-c/sh/m and MAC-d in case of configuration without MAC-c/sh/m. 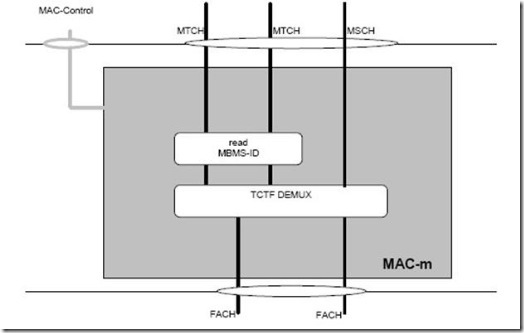 Both entities together provide a controlled data flow between the MAC-c/sh/m and the MAC-hs (Configuration with MACc/sh/m) or the MAC-d and MAC-hs (Configuration without MAC-c/sh/m) taking the transmission capabilities of the air interface into account in a dynamic manner. This function is intended to limit layer 2 signalling latency and reduce discarded and retransmitted data as a result of HS-DSCH congestion. This function manages HS-DSCH resources between HARQ entities and data flows according to their priority. Based on status reports from associated uplink signalling either new transmission or retransmission is determined. Further it determines the Queue ID and TSN for each new MAC-hs PDU being serviced, and in the case of TDD the HCSN is determined. Selection of an appropriate transport format and resource for the data to be transmitted on HS-DSCH. 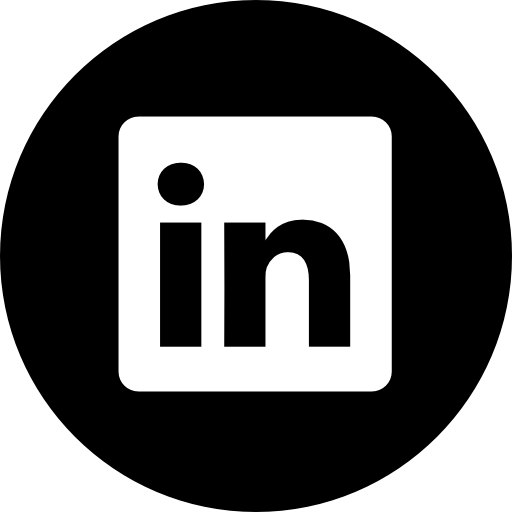 For each UE, there is one MAC-es entity in the SRNC. The reordering queue distribution function routes the MAC-es PDUs to the correct reordering buffer based on the SRNC configuration. This function reorders received MAC-es PDUs according to the received TSN and Node-B tagging i.e. (CFN, subframe number). 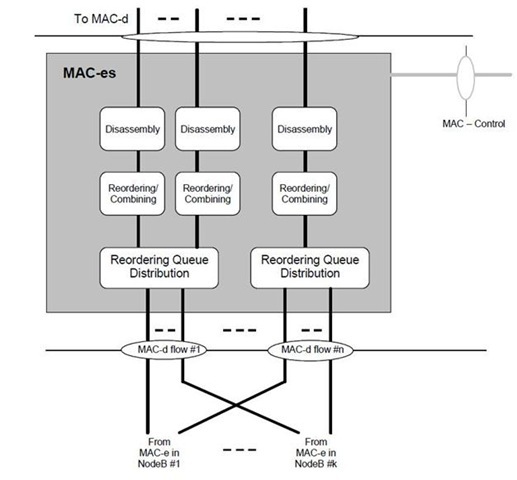 MAC-es PDUs with consecutive TSNs are delivered to the disassembly function upon reception. There is one Re-ordering Process per logical channel. The function is performed in the MAC-es, in case of soft handover with multiple Node-Bs. This means that the reordering function receives MAC-es PDUs from each Node-B in the E-DCH active set. 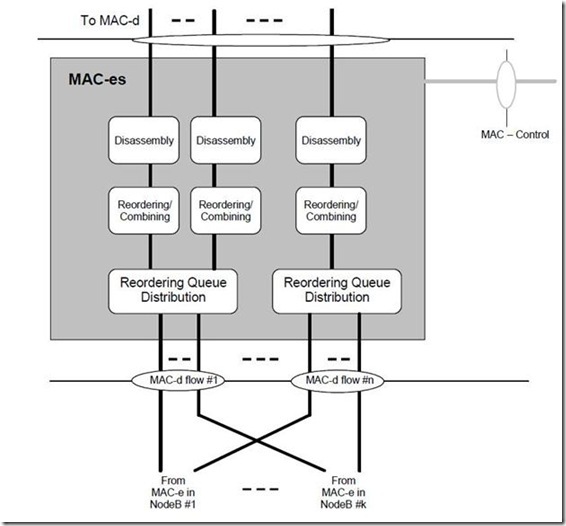 The disassembly function is responsible for disassembly of MAC-es PDUs. When a MAC-es PDU is disassembled the MAC-es header is removed, the MAC-d PDU’s are extracted and delivered to MAC-d. There is one MAC-e entity in the Node B for each UE and one E-DCH scheduler function in the Node-B. This function manages E-DCH cell resources between UEs. Based on scheduling requests, Scheduling Grants are determined and transmitted. The E-DCH control entity is responsible for reception of scheduling requests and transmission of Scheduling Grants. This function provides de-multiplexing of MAC-e PDUs. MAC-es PDUs are forwarded to the associated MAC-d flow. 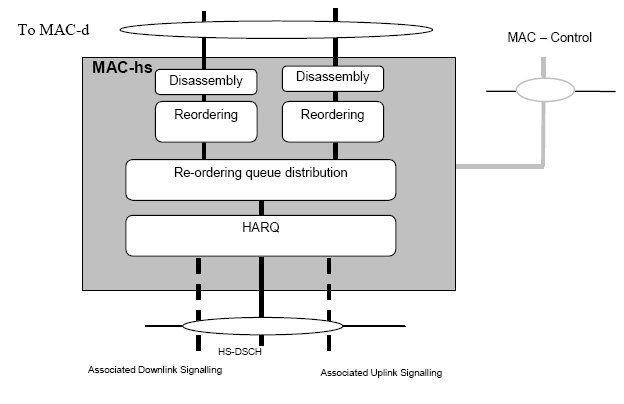 One HARQ entity is capable of supporting multiple instances (HARQ processes) of stop and wait HARQ protocols. Each process is responsible for generating ACKs or NACKs indicating delivery status of E-DCH transmissions.